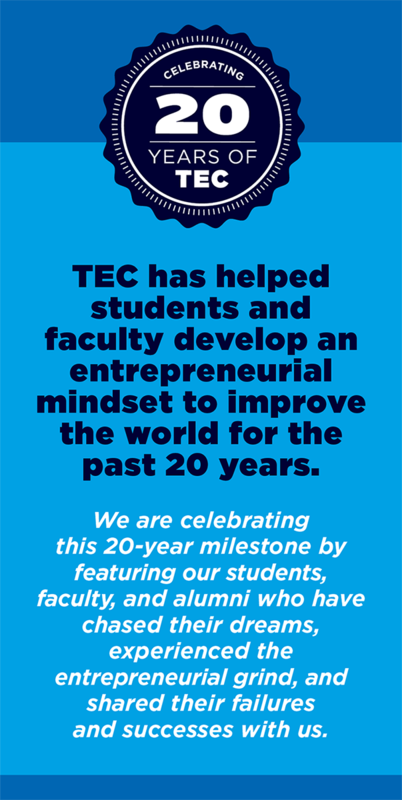 Each month, TEC shines the spotlight on one student involved in our courses, programs, or both! The entrepreneurship ecosystem at Illinois is unique because there is an emphasis on collaboration over competition, says Kendall Furbee, Co-Founder of Cut To The Case. Learn how the ecosystem at Illinois pushed Kendall Furbee out of her comfort zone, and helped in the creation of her startup. What inspired you to launch Cut to the Case? Did you have many ideas on your mind before you pursued Cut to the Case? I was inspired to start Cut to the Case after seeing how prevalent sexual assault and harassment are on our campus and across the United States. Sexual misconduct is present in different environments including the media, sports, and the workplace. It was alarming to learn of the number of sexual offenses that go unreported and the barriers to reporting as the current process stands. Once I interacted with people who had gone through the sexual misconduct reporting process, I couldn’t stop thinking about the issue. I wanted to prevent others from experiencing the same pain and trauma. Cut to the Case was formed around the idea of using technology to create a victim-centered investigation process to bring perpetrators of these crimes to justice. I had a few other ideas but was most passionate about Cut to the Case because of the cause. I was always innovative but never realized launching a company could be a reality for me until I came to the University of Illinois at Urbana-Champaign. When I joined MakerGirl and Cast21 in my freshman/sophomore years of college, I had role models for the first time- other college students and entrepreneurs who made me dream of starting my venture and helped me make it a reality. These experiences constantly pushed me out of my comfort zone and were instrumental to the inception of Cut to the Case. We’ve gotten positive feedback on our prototype from the University of Illinois Police Department (UIPD) and are currently working to implement their suggestions into our platform. The Illinois Coalition Against Sexual Assault (ICASA) and Illinois Attorney General’s Office have helped immensely and supported us along the way as well. We’re always looking to talk to more police officers, sexual assault advocates, attorneys, and victims of sexual assault. We want to ensure we are asking the right questions (that would aid an investigation) in the most comforting and empowering way. Our plan is to pilot at the University of Illinois and expand from there. How is the entrepreneurship ecosystem at Illinois helping? The entrepreneurship ecosystem at Illinois is unique because there is an emphasis on collaboration over competition. The people within the ecosystem have always encouraged us and offered feedback. It’s awesome to work alongside other student entrepreneurs that are in the same boat as you. They all have extensive knowledge and experience, and help hold you accountable. Most importantly, these people want you to succeed. They are there to support you during both tough challenges and major milestones. Do you think social entrepreneurship as a business model is getting popular? Is it sustainable? Did you imagine yourself as a social entrepreneur? I do think social entrepreneurship is getting more popular. People care about social issues and want to incorporate this into their careers. Social ventures need a solid foundation because sustainability is a common pitfall. It can be sustainable, but the impact cannot overshadow the need for revenue. At the University of Illinois, there is increasing momentum around social entrepreneurship, making it the perfect time to get involved. There are many upcoming events and places that foster cross-campus collaboration (3DS, Siebel Center for Design) to make our community and world a more sustainable place. As a social entrepreneur do you face a different set of challenges besides the usual challenges of following an entrepreneurial career path? What motivates you to keep moving forward, since a social venture is not about making profits? Aside from sustainability, tackling a problem deeply rooted in society is a challenge. There are many stakeholders involved and the implications are too great. It’s easy to stay motivated while working on a social venture if you are passionate about the cause. We interviewed hundreds of people through the NSF I-Corps program and it was an eye-opening experience to see how technology could have eased victim’s trauma and changed the trajectory of their lives. Sexual assault and the reporting process that follows are shark bite problems. Simply talking about these issues makes an impact. It’s impossible for me not to be motivated to move forward with Cut to the Case when it has the potential to protect innocent people and bring perpetrators to justice. Cozad held us accountable. It provided us with the mentorship and skills necessary to set and achieve focused goals. 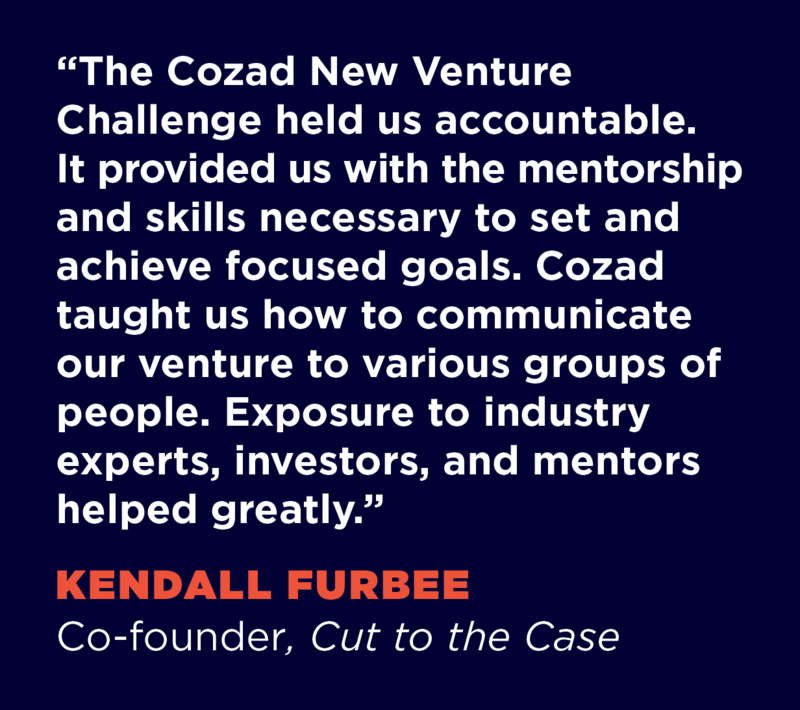 Prior to Cozad, we were attempting to solve sexual assault in its entirety. While this is an important issue, we realized that we could make a much larger impact on the problem of under-reporting on college campuses specifically. Besides helping us refine our idea, Cozad taught us how to communicate our venture to various groups of people. Exposure to industry experts, investors, and mentors helped greatly. Knowing how to pitch your startup in a quick and effective manner with an understanding of your audience is an important skill for social ventures. What other entrepreneurial resources, programs or classes at Illinois did you utilize for Cut to the Case? We were in the iVenture Accelerator Cohort 3 which has been my favorite. We have also taken advantage of SocialFuse, Founders Microgrants, Chicago Entrepreneurship Workshop, ThinkChicago, 54.io, and Forge. I’ve taken TE250 (Idea to Enterprise) and TE461 (Technology Entrepreneurship) which have been great for formulating an idea and getting it off the ground. Do you think college is the right time to launch a startup? Why or why not? There is never a wrong time to launch a startup, but college is the most risk-free time to do so. There are more resources here than anywhere else- experienced industry professionals offering mentorship, programs providing funding (Cozad), and groups across campus offering support (Intellectual Property Clinic), to name a few. College is a great time to push yourself out of your comfort zone, too. The first time I competed in Cozad, I completely froze during my pitch. I was so embarrassed, but the faculty, judges, and more experienced students offered to help me practice getting better. I competed in Cozad the next year with Cut to the Case. We were one of the finalists and I successfully pitched to over 150 people. College is the best place to try something new, iterate, and learn from the experience. As a woman in entrepreneurship, what strategies did you find most helpful to overcome any barriers you may have encountered? Initially, it can be discouraging to pitch at a competition and look into the crowd of 99 men and 1 woman. I think it’s helpful to realize that the woman is probably feeling the same way as you do. For me, having a female support network like the Women in Entrepreneurship group on campus has been key to overcoming barriers. This group helped me learn the importance of being confident and owning my accomplishments. What, according to you, is the biggest challenge when choosing entrepreneurship? It’s difficult to gain the mentality that failing often and hard is a good thing. When learning an instrument, studying for an exam, or learning a sport, you are taught that practice makes perfect. Running a startup isn’t like that at all. There’s no guidebook specific to your startup or rule book to follow when you fail. Failure can make entrepreneurship daunting at first, but the outcome of developing the mentality that failure is necessary is so rewarding. What’s next for you? Future plans? Any other startup ideas in mind? Right now I’m focused on increasing the number of female entrepreneurs and social ventures at the University of Illinois because representation among these groups is important. I plan to continue my work with Cut to the Case and pilot at the University of Illinois soon.